Crawley Town's 3-1 win over Yeovil was a sign of the new found togetherness instilled by their new boss, according to striker Ollie Palmer. 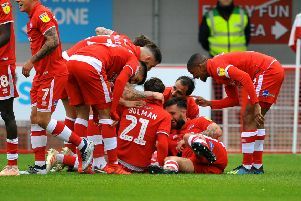 Summer signing Palmer scored his sixth goal of the season — the joint second highest total in the league — to open the scoring on Saturday, setting the Reds on their way to a second home win under Gabriele Cioffi. The former Lincoln City man, who was signed by former boss Harry Kewell in June, said the new man in charge has brought the whole team together in the short time he has been at the club. He said: "He’s come in and really brought everyone together. He’s got a big personality which is massive. "On and off the pitch he is passionate. Personally with me, he’s been fantastic, so I am really enjoying playing for him. "Some people seemed to think I was on a goal drought after three games without one, so I really wanted to get him a goal as soon as I could. I’m delighted to get one today. “Of course I would have liked to get a couple more but I can’t be too greedy. One goal, a good performance and a good team performance more importantly." Palmer said the win over Yeovil was a 'fantastic' result against a side who have recorded 6-0 and 4-0 away wins already this term, and he reserved particular praise for man of the match Luke Gambin, as well substitute Ashley Nathaniel-George whose stunning strike restored the hosts' lead. He added: "Yeovil are a good side. Away from home they are very good so we have got to pat ourselves on the back. “Luke Gambin was excellent today, I played with him at Luton. He’s a good lad. "We’ve got loads of talent here, like Ash(ley Nathaniel-George). "Everyone is fighting for places, he’s young and has a lot to learn but he’s a fantastic talent. "You can’t put the young kids under too much pressure. Hopefully we can have a good season and get more wins like that."